All Star Family Feud will premiere on TEN 7:30pm Monday March 14. In the first of the one hour specials, AFL will face off against NRL, raising money for charity. 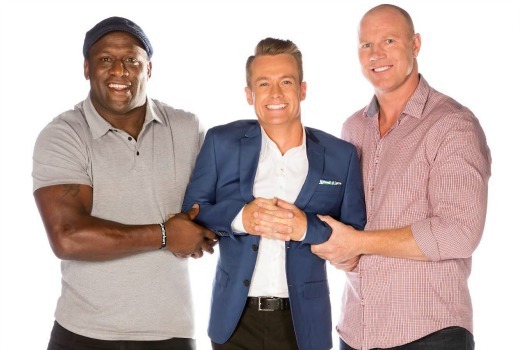 This week NRL legends will take on AFL legends – captained by Wendell Sailor and Barry Hall. Wendell’s team includes legendary players Preston Campbell and Robbie Kearns and Melbourne Storm’s Tohu Harris. Barry’s team includes North Melbourne Kangaroos’ Brent “Boomer” Harvey, Melbourne Demon Jack Viney and AFL legend Kevin Sheedy. Which code will win the ultimate battle off the field? Will this be on three channels? Yesterday, I looked on the TV Guide and noticed that the All Star Feud will not simulcast on 3 channels. Don’t hold your breath for a last minute change. It had to come sport infecting another show! This photo might be more effective if they actually showed Grant’s two feet being two feet off the ground. They did, but it doesn’t work in landscape.